The church of St Peter in Thurleigh is situated at the east end of the village on the High Street. Parking is difficult outside the church. 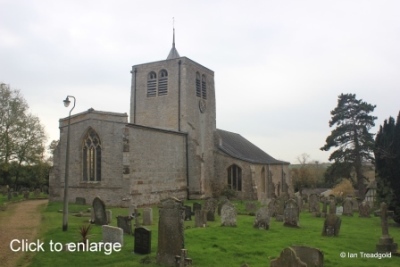 The chancel is around 28 feet by 17 feet, the nave is around 54 feet long by 22 feet with the aisles adding around 10 feet each. The central tower is around 15 feet square and some 54 feet high. 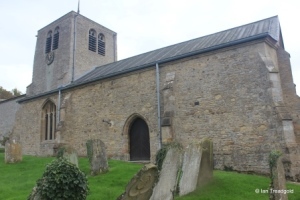 There is evidence of an early church dating from C11 on this site but nothing remains of that building. 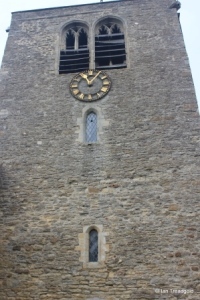 The oldest surviving part is the tower which dates to the mid C12 and has always stood as a central tower. 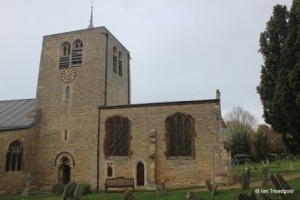 The aisles were added to the early church in C13 and the chancel was rebuilt in C14 with the nave, aisles and upper parts of the tower rebuilt in C15 when a clerestory was added. 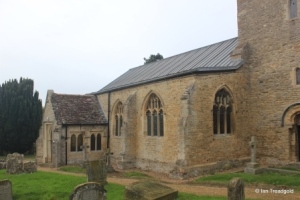 During restorations to the aisles and nave in the 1970’s the clerestory was removed and the current roof installed. 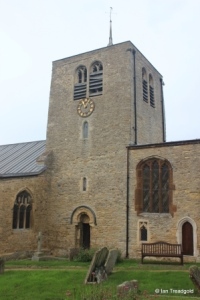 The church was rededicated following these works in 1971. 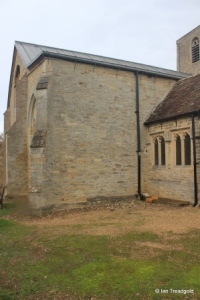 The church is built of random rubble with a few patches of the original render remaining although there are a few restored areas done in brick. 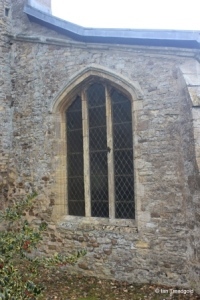 The south side of the chancel has two large windows surrounding the priest’s door along with a low-side window below the western window. 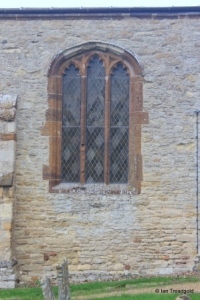 The two windows are unusually in ironstone which provides a nice contrast to the limestone rubble of the walls. Each is three stepped cinquefoiled lights under a four-centred arch. 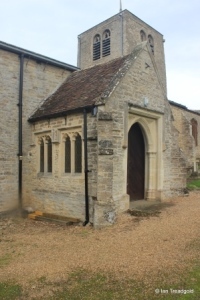 The priest’s door is under a plain arch and the restored square headed low-side window has a single trefoiled light under an ogee head. 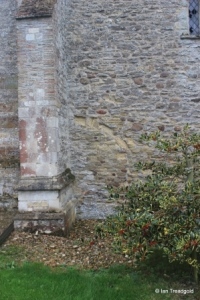 The lower part of the central tower dates from the C12 and the difference in masonry to the higher levels is clear with the upper parts being rebuilt in C15. 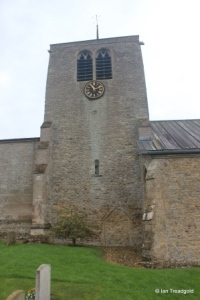 There is a small spire and clock faces to the north and south. 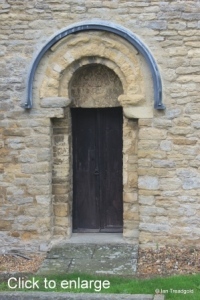 The south door to the tower is of Norman origin with a round arch and tympanum depicting Adam, Eve, the serpent and the Tree of Knowledge. The open belfry lights are conjoined pairs of cinquefoiled lights under four-centred arches with rather dilapidated wooden shuttering. 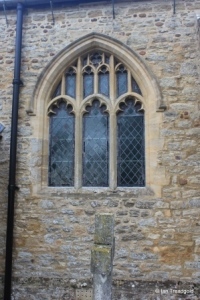 The south aisle has four windows, three to the east of the porch with just the west window to the west of the porch. 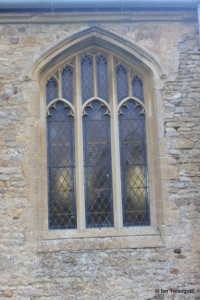 All three windows are of a similar style being of three cinquefoiled lights with perpendicular tracery above under two centred arches. 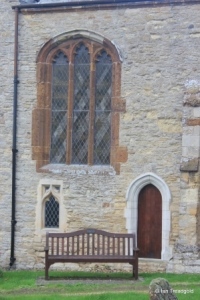 The south porch is well endowed with windows with two square-headed pairs of cinquefoiled lights on each side. 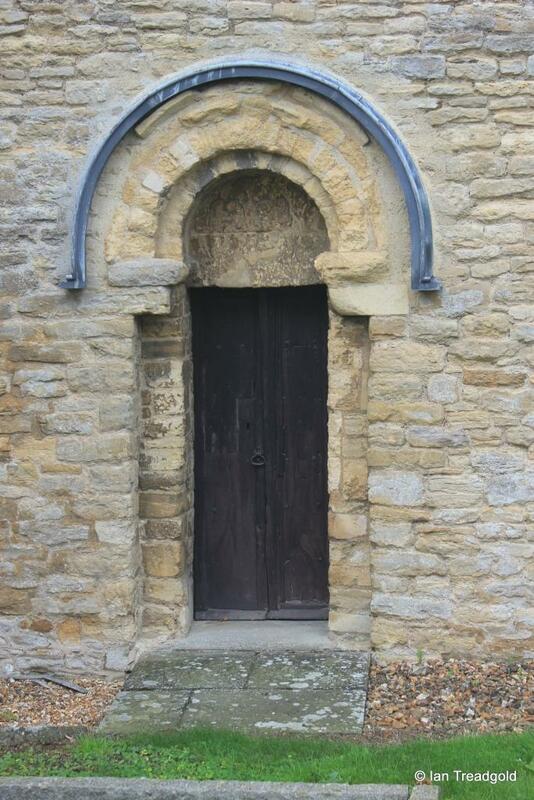 The outer doorway is also under a square head with trefoil designs in the spandrels. 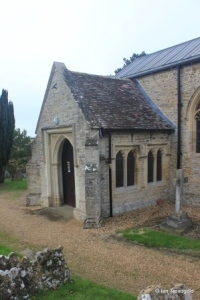 There is a sundial above the doorway. 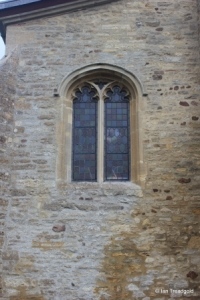 The west window of the south aisle is identical to the other south facing windows of the aisle. The west window of the nave is a grand affair of four cinquefoiled lights with a transom and perpendicular tracery under a four-centred arch. 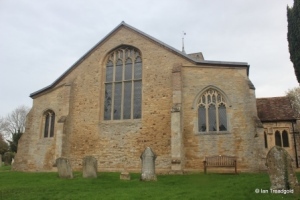 The north aisle is rather sparsely populated with windows with just a single north facing window, a north doorway and east and west windows. 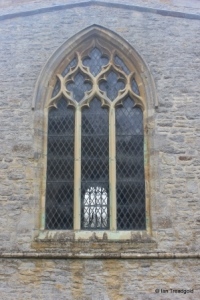 The west window of the north aisle is of two cinquefoiled lights under a flattened two-centred arch with a small quatrefoil design in the head. 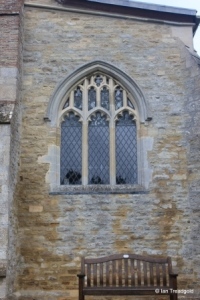 The only north facing window is tall and of three cinquefoiled lights with simpler perpendicular tracery under a pointed four-centred arch. 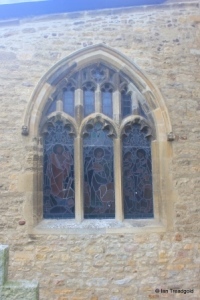 The east window of the north aisle dates from C15 and has three lights from which the cusps have all but disappeared under a pointed four-centred arch. 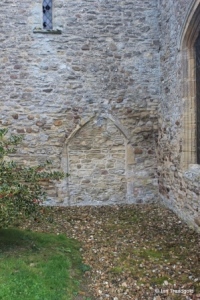 The base of the tower on the north side shows remains of a blocked doorway and a low arch which presumably at different times would have led to an outbuilding of sorts. 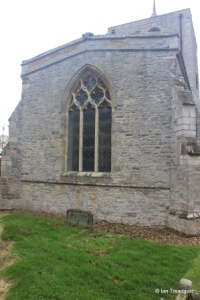 The chancel has no windows at all to the north. 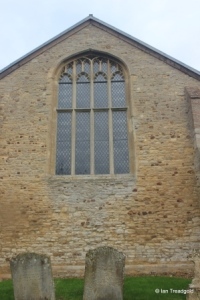 The east window is quite small for the size of the east end and had three trefoiled lights with net tracery under a pointed arch. 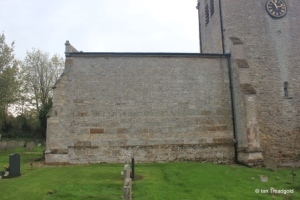 The east end has a parapet which unusually does not extend along the north and south sides of the chancel.